Search for the best flight prices from Manchester Airport to Genoa. Compare prices, book today and save money with Manchester Airport. Often described as one of the most underrated cities in Italy, Genoa is a beautiful destination in the northwest of the country. 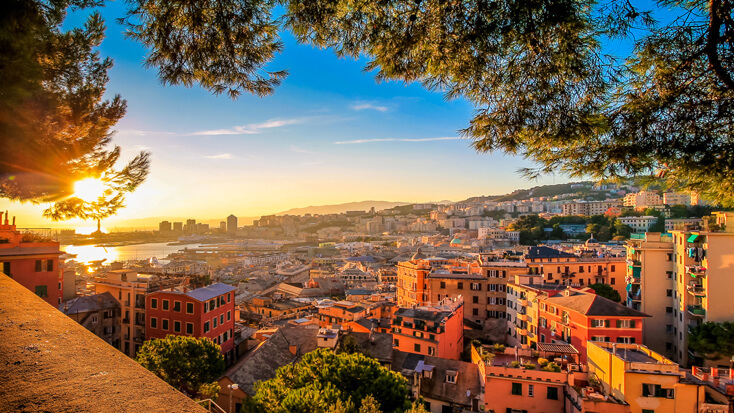 It has a rich history that dates back further than the Roman Empire – in fact, Genoa was once the capital city of its own empire, the Most Serene Republic of Genoa. In recent years it has become well-known for its football team, Genoa F.C, and its spectacular aquarium which reaches out into the city’s bustling harbour. With so much history, many attractions and lots of unique events throughout the year, Genoa is a fantastic alternative destination for lovers of Italian culture. Genoa has a wide range of accommodation to suit all visitors, including luxurious holiday complexes, upmarket city hotels and smaller tradition bed and breakfasts. Fans of director Wes Anderson should consider the Grand Hotel Savoie, which not only offers tremendous service but also bears a striking resemblance to the acclaimed director’s Grand Budapest Hotel. Those seeking extravagance may want to consider a stay at the Melia Genova, which boasts an indulgent spa and stylish contemporary suites. If you fancy a more traditional experience, the Olympia Hotel Genova has a classical Italian theme that’s both rustic and charming. While Genoa isn’t a traditional destination for shoppers, the city has plenty for those looking to enjoy a shopping spree. The Fiumara Shopping Centre should be at the top of anyone’s list if they’re looking for big-brands and high street staples. However, if you’re more interested in local crafts and produce, the Via Garibaldi and Mercato Orientale offer many souvenirs and ornaments for the home. Food lovers may also want to visit the Romeo Viganotti, the oldest chocolate factory in the region, and sample some of their delicious treats. As one of the cooking capitals of the world, Italy offers plenty of cuisine for tourists to enjoy, Genoa continues this tradition with many local delicacies of its own. The region is well known for its signature pesto and focaccia bread, which makes the perfect snack in between visits to the city’s attractions. Those looking for something a little stranger may want to try savoury Torta Pasqualin pies or Forinata pancakes. Of course, many of Genoa’s traditional restaurants offer plenty of fresh pasta and pizza for an authentic Italian taste. A gigantic floristry and gardening festival held every five years, Euroflora is iconic to Genoa and sees half a million professional florists visit the city. The streets become filled with flowers and incredible natural arrangements as visitors compete to show off their talents. Ran by the Suq Genova society in June, Suq a Genova is a festival of enlightenment that brings world music, thought-provoking lectures and art to the streets of the city. There are lots of celebrations and fireworks to enjoy, making this a perfect event for tourists visiting with children. Held in December, Circumnavigando is a winter festival of clowns that floods the streets of Genoa with street performers. There are few painted faces to be found, but plenty of hijinks and circus skills – a great alternative Christmas holiday for families.